Woodland herbs in the trillium family have evolved interesting traits that lure insects into helping them reproduce. The trillium family belongs to the lily plant order, and it includes 45 species and 5 hybrids found in North America and Asia. More species live in North America and the center of trillium evolutionary origin is probably the southern Appalachians. Species of trillium were likely widespread in the tropical to temperate forests that occurred across both continents during the Miocene over 5 million years ago. This is likely when trillium evolved a dependent relationship with bees, ants, and flies. Some species of trillium, such as the great white (Trillium grandiflorum) produce flowers that attract bees and wasps with a sweet smell. But others, such as the inaptly named little sweet betsy (T. cunacateum), have flowers that smell like rotting meat, and the red color looks like flesh, so they attract flies. These flying insects help pollinate the trillium plants. Little sweet betsy–more accurately known as bloody butcher because they smell like rotting meat. The flesh color and carrion smell of the flowers attract flies, and in turn the flies pollinate the flowers. By contrast the flowers of the great white trillium smell sweet and attract bees and wasps for pollination help. Ants disperse trillium seeds throughout the forest. Aphaenogaster picca is an example of an ant species that mostly preys on termites but takes advantage of the passive trillium seeds when they have a chance. Trillium produce a fruit with over a dozen fat covered seeds that attract ants. This layer of fat is known as the elaiosome, and it surrounds a hard seed. 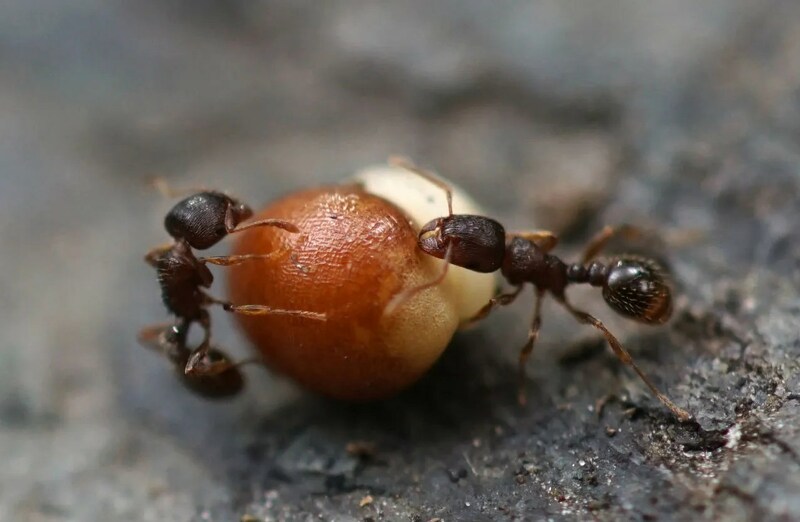 The ants carry the fat rich seeds back to their nest, but discard the hard seeds after consuming the nutritious coating. This helps spread the species throughout the environment. Most of the species of ants that consume trillium seeds normally prey on termites, worms, and grubs–the trillium seeds are an easier meal that puts up no resistance. Plants that depend upon ants to disperse their seeds are called myrmecochorous. For years many scientists were mystified at how trillium and other plant species so rapidly recolonized land formerly covered by glaciers. This is known as Reid’s paradox defined as the unexplained mystery of how some plant species apparently recolonized post glacial habitats faster than their modern dispersal rates suggest. It is mathematically impossible for ants to have dispersed trillium across New England and parts of Canada in less than 10,000 years. However, scientists recently discovered deer feces containing viable trillium seeds. Apparently, white tail deer eat trillium fruit and spread the seeds into new territory. This would answer Reid’s paradox. However, high populations of white tail deer can be detrimental to trillium populations. 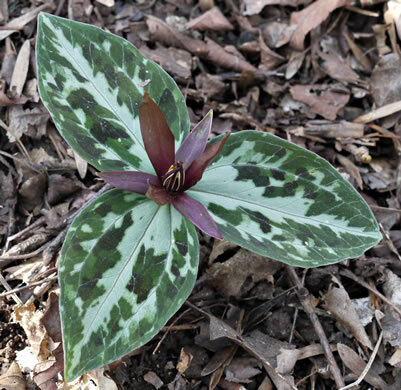 Trillium plants are perennials, capable of surviving from the same root for up to 25 years, but repeated deer consumption of the leaves can kill the plant. Deer also choose to eat the largest trillium plants, thus selecting for smaller and less productive individual trillium plants. I hypothesize extinct tapirs and possibly long-nosed peccaries also fed upon and dispersed trillium during the Pleistocene. The relict trillium (T. reliquum) is known from just 50 sites along the fall line, mostly in Georgia. A genetic study determined this species survived in 2 different Pleistocene refuges during Ice Ages when much of the landscape became desert like. There is actually greater genetic diversity on the eastern and western parts of its range rather than in the central part. The relict trillium, also known as the Confederate wake robin. It is an ancient species that became rare because of Ice Ages.